53 posts categorized "Chabad & Holocaust"
An obituary on Chabad's official website again shows that Chabad has not come to grips with the bad behavior of its rebbe during WW2. “Who in fact died and who remained alive had nothing to do with the Nazis,” Rabbi Manis Friedman stated in a speech delivered in Melbourne in the 1980s. “Not a single Jewish child died because of the Nazis … they died in their relationship with God.…Bad things did not happen to our grandparents … No evil befell them." US District Court Chief Judge Royce Lamberth had a quick rejoinder for the Department of Justice lawyer: "How can you be counterproductive from zero?" A haredi 'expert' argues Yad Vashem, Israel's national Holocaust memorial museum, discriminates against haredim. The sixth Lubavitcher Rebbe was hiding in war-torn Warsaw during the days after the German invasion in 1939. After locating the rabbi at the order of Adm. Wilhelm Canaris, the head of the so-called Abwehr, Maj. Ernst Bloch, whose father was Jewish but who had no particular love for Judaism or those who practiced the religion fervently, enabled him to escape to safety in Latvia. But will the Rabbinical Center of Europe teach students about Chabad's unique role in opposing rescue attempts during the Holocaust, its claim that Reform and secular Jews caused the Holocaust, and its claim that only the messiah would stop Hitler? Chabad wants the head of Nazi Germany's Military Intelligence to be granted Righteous Gentile status by Yad Vashem. Nazi officer saved rebbe at request of US. 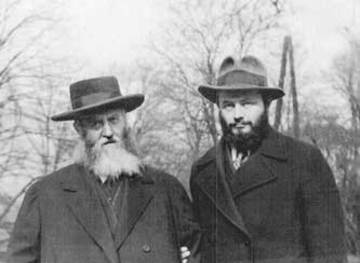 No Lubavitcher rebbe can be said to have rescued Jews during the Holocaust. But one Schneerson family member did. Haredi theodicy rears its ugly head, again. Haredim and the Holocaust, cont. Will Chabad Whitewash The Murder Of Raul Wallenberg? The Russian government turned over to the country's Chief Rabbi Berel Lazar crucial documents dealing with the case of Raoul Wallenberg, a Swedish diplomat who saved thousands of Hungarian Jews during the Holocaust, the Associated Press reported last week. Questions over Wallenberg's death have long gone unanswered and many speculate that after being arrested by Soviet forces in 1945, he was murdered under orders by secret police. According to the AP report, Nikolai Patrushev, director of the Federal Security Service, the successor agency to the notorious KGB, handed to the rabbi photographs and copies of formerly classified materials about Wallenberg. The Federation of Jewish Communities of the Former Soviet Union, whose activities are overseen by Lazar, a Chabad-Lubavitch rabbi, had requested the documents in connection with its new Museum of Tolerance, set to open in Moscow next year. During World War II, Wallenberg distributed Swedish passports to Jews who were being deported and won diplomatic protection for sections of Budapest. The Russian government said that he died of a heart attack in 1947 while in prison, but his family and others maintain that he was executed. You may have also noted the name of Chabad's 'museum,' the "Museum of Tolerance." Lazar stole that name and the entire concept from the Simon Weisenthal Center. 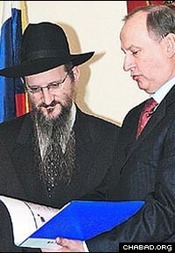 So how did a thug like Berel Lazar become 'chief rabbi' of Russia? He was put in power by other thugs. No honest person one should take Lazar's thuggery lying down. They only thing that will move Chabad is money. Withhold it and tell Chabad you won't give, no matter how much you like your local Chabad rabbi. No more money, tell them, until Berel Lazar is removed from his post and permanently exiled back to his Italian homeland. avrohom, a Chabad follower and frequent (and rude) commenter on this blog, continues to insist the 6th Lubavitcher Rebbe was a blameless tzaddik, a fount of perfection who never erred and who certainly never opposed Holocaust rescue. …[T]he Rebbe [Joseph Isaac Schneersohn] of course wanted to escape Europe and had his movement employ every means, even approaching the Secretary of State, to get him out, but when he was here in the US, he did not approach those very same people to help rescue those who had to remain in Europe. However, he did approach those people in the government to rescue his library, which he did get out in 1941. Are books more important than people? Some of the books were secular like Dante's Inferno and books on Communism. This is a sad part of the history of the Rebbe. Also he started [publicly] condemning people who were organizing amazing rescue efforts like rabbis Kotler and Kalmanowitz of the Vad-Haatzala. He claimed they and Reform and Kofrim Jews were causing the Holocaust with their non-Kosher ways. Yet, we see that Kotler and Kalmanowitz helped rescue up to 100,000 people with the War Refugee Board. The Rebbe felt they were unnecessarily compromising their religious integrity by meeting with politicians on the Sabbath and secular and reform leaders. So the Rebbe made mistakes and according to Chancellor or Yeshiva University, Norman Lamm, he committed blasphemy by claiming God was punishing the Jews for their sins with the Holocaust. He claims this is a desecration of God's name (Menachem Mendel Schneerson also said that saying such a thing is a desecration of God's name without mentioning his father-in-law). These facts and many more show how much Chabad does to ignore unpleasant facts about their history. They just claim that when people write such things, they are jealous of their movement, do not understand their people or on a political campaign to smear them. Very weak arguments and signs of inferiority complexes. So basically this story shows that instead of pointing fingers, we need to act and make a difference. Small minds blame others; big ones blame themselves and then seek out action to make the situation better. What people wanted was a hero of the Jewish people fighting for their rights. Instead, the Rebbe just thought of himself and his movement and condemned others. He was not helping the problem, but creating more. He should have worked with Kotler and Kalmanowitz, or at least have tried to, instead of [publicly] condemning them and a host of others. …Now to Kotler and Kalmanowitz--They took help from everywhere they could. Kotler was appalled by the Rebbe's focus on the Messiah and his spiritual campaign, especially throughout 1942-1943 when all energy should have been focused on rescuing lives. So, Kotler and Kalmanowitz would have gladly received help from the Rebbe, but such help never came from the Rebbe. He only condemned them for their un-kosher ways. For the record, I wanted to find the Rebbe acting like Kotler and Kalmanowitz. That would have been a beautiful conclusion to the story. Rabbi Weisfogel, who was Kalmanowitz's assistant, said of the Rebbe "He was a moral failure at this time to condemn us and the Jewish people as a whole for the Holocaust when he in turn did hardly anything except rescue his books and few [close] students' lives." For the record, if I was a business man, as many Lubavitchers encouraged me to be, I would not have mentioned his dealings in the US after his rescue. As one Lubavitcher at 770 told me "If you do this, you will get thousands of dollars and go all over the Chabad world and give talks." Yes, I said, but that is not the truth. To this, he was silent. And we also have one entire chapter of his book, Rescued From The Reich, that deals with the 6th Lubavitcher Rebbe's behavior once he reached America. (This is the part of the book Rigg meant when he wrote, "if I was a business man, as many Lubavitchers encouraged me to be, I would not have mentioned his dealings in the US after his rescue.") That behavior included telling people, both through his 'newspaper,' HaKriah v'HaKedushah, and through other writings that those people collecting money on Shabbos to save lives were wrong, were delaying the "redemption," were causing more Jews to die, etc. Those "people" doing that on Shabbos were the rabbis and laypeople of the Va'ad Hatzalah, and they rescued thousands of Jews. The 6th Lubavitcher Rebbe started his own "Pidyon Shvuyim Fund" to compete with the Va'ad Hatzalah. What did Joseph Isaac Schneerson do with the money he raised? A large chunk of it went to open his Brooklyn yeshiva. Yes, that is correct – the 6th Lubavitcher Rebbe took money meant for rescue, meant to save Jews from the Holocaust, and instead opened a Brooklyn yeshiva with it. And, if that is not enough, the 'Grand Rabbi' of Lubavitch started a 'moshiach campaign.' Why? Because he believed only the coming of the messiah would end the Holocaust and all efforts on the ground – like those of the Va'ad Hatzalah – would be futile. The Va'ad Hatzalah's efforts led to the creation of the War Refugee Board. So, along with the thousands saved directly by the Va'ad Hatzalah, another 100,000 to 200,000 Jews were saved indirectly through the War Refugee Board. And, yes, the great 'tzaddik' of Lubavitch thought the War Refugee Board was a futile endeavor, as well. And let us not forget that the great 'tzaddik' of Lubavitch was also an ardent anti-Zionist who urged Jews to stay in Europe. Here is a copy of the 5th Lubavitcher Rebbe's anti-Zionist letter circulated throughout Europe. His son, the future 6th rebbe, was head of the Lubavitch Yeshiva at that time. He fully endorsed his father's anti-Zionism and issued anti-Zionist tracts of his own. More on those sometime in the not too distant future. When I spoke with Barry Gourary [the only grandchild of the 6th Lubavitcher Rebbe; the teenage Barry was rescued together with his grandfather, grandmother and his parents in the rescue described in Rigg's book] three months ago, I asked him about the Holocaust and his grandfather and father's reaction to it. Barry thought both did eveything possible to rescue Jews, although he had no proof or information to back up that belief. He told me his father backed Rebbe Yosef Yitzchok Schneersohn's moshiach campaign – done in instead of rescue – because "my father was a chassid of my grandfather." Barry was very precise in his answers: "I do not know." "I do not remember." "I do not think so." Or specific answers with specific details. His answers seemed completely credible and were given freely. Sadly, the fact that his belief that the RAYATZ, etc. did everything they could to rescue Jews was nothing more than a belief – he had no facts, no documents, not even any stories to support it – says volumes about the failings of Lubavitch leadership during WW2. One can also see that Chabad had no significant presence at the now-famous "Rabbis' March" on Washington. No senior Lubavitch rabbi attended. The march – created by Hillel Kook [a.k.a. Peter Bergson] and promoted by the Va'ad Hatzalah and Agudas HaRabbonim – brought the formation of the War Refugee Board which saved 200,000 Jews during the last years of the Holocaust. Of course, Yankie Tauber is fibbing. Previous posts: 1 & 2. In his op-ed in Haaretz on June 1 ("God as surgeon"), Prof. Yehuda Bauer refers to the opinion of the late Lubavitcher Rebbe regarding the Holocaust. Without responding to his unwarranted, unacademic, personal attacks against the Rebbe, I think that Bauer gravely misunderstood the nuances and delicate concepts that the Rebbe was conveying in his 1980 letter to Knesset member Chaika Grossman. The letter to the late MK Grossman was written to an individual whom the Rebbe surely understood to be in a position to correctly understand its contents without more explanation. I am sure that Prof. Bauer, too, writes in one language when corresponding with colleagues and in another when writing for the general public. Nothing in the letter to Grossman contradicts anything the Rebbe said before or after; anything said before or after simply expounds upon and clarifies the concepts written in that letter in a relatively condensed manner. The quoted letter is published in "Likutei Sichot" (Vol. 21, page 397). I would suggest that any serious student of this issue study that letter in its entirety and original before forming any opinion. In the letter, the Rebbe was responding to MK Grossman's published questions regarding the Rebbe's published views. The Rebbe first expresses his astonishment at the fact that she based her criticism on an unedited version of the Rebbe's talks, which was subject to slight misquotes or lacking adequate context, and admonished her for publishing criticism without first checking with him what he meant to say. The Rebbe then establishes in no uncertain terms who the "good guys" and who the "bad guys" are. When referring to those who perished in the Holocaust, we say "Hashem yikom damam" - meaning "may God avenge their blood." We refer to them as kedoshim, holy individuals. When referring to Hitler and his like, we always add the epithet "yemach shmo," that is, "may his name be obliterated." The Rebbe then goes into a lengthy, detailed explanation of his view, addressing the issues at hand point by point in a detailed albeit condensed way. Prof. Bauer quotes the Rebbe as saying that "Hitler was a messenger of God in the same sense that Nebuchadnezzar is called 'God's servant' in the Book of Jeremiah (Chapter 25)." How do you, Prof. Bauer, explain Jeremiah's reference to Nebuchadnezzar? The Rebbe, with this quote, simply draws attention to the biblical precedent seeing in each and every event the hand of God, however inexplicable to the human mind or painful to the human heart. Bear in mind that Nebuchadnezzar was not rewarded, but punished, for what he did. In his letter, the Rebbe points out both a similarity as well as a distinction between Nebuchadnezzar and Hitler. Whereas the massacres in Jeremiah's times are understood to be a punishment, the Rebbe insists that the Holocaust cannot be understood in this way. The comparison with Nebuchadnezzar was merely intended to make the point out everything that happens in this world is part of God's design, however incomprehensible it might be to the mortal mind. Here we find yet another example of the inaccuracies appearing in Prof. Bauer's article. He writes: "The Rebbe's stance, therefore, is clear: The Holocaust was a good thing because it lopped off a disease-ravaged limb of the Jewish people - in other words, the millions who perished in the Holocaust - in order to cleanse the Jewish people of its sins. The 'surgery' he spoke of was such a massive corrective procedure that the suffering (i.e., the murder of the Jews) was minor compared to its curative effect." This is a gross misinterpretation. Prof. Bauer misunderstood the comparison to surgery. Careful reading of the letter will show that the example of surgery is brought only in order to illustrate how something as horrible as an amputation, although beneficial, can seem criminal to the uninitiated. It is by no means brought in order to imply that those that perished were "amputated" for the benefit of the survivors. The Rebbe clearly writes that although we have no understanding as to why the Holocaust had to happen, we do believe that it is for the benefit primarily of those that perished (not merely for the benefit of the survivors). The Rebbe does not attempt to explain what the benefit is; he simply asserts that it must be for the (eventual?) benefit of those who perished (especially taking into account our belief in resurrection and the world-to-come). The Rebbe points out that even when the one going through the surgery knows that it is for his benefit, he still cries out in pain, as do those nearest and dearest to him. It is perfectly normal and theologically acceptable for a believing Jew to cry out in pain and clamor to God for mercy, when suffering or when witnessing the suffering of others. These are just a few examples of how slight inaccuracies in quotes and context can generate conclusions totally contrary to those intended. One must be more careful when quoting our sages and their words and make sure that it is done accurately before taking issue with them. Rabbi Eliezer Shemtov is director of Beit Jabad del Uruguay in Montevideo. There are several schools of thought in classical Judaism about why bad things â mega bad things â happen to the Jewish people. Most are predicated on God's involvement in the bad, and explain that by saying we do not truly understand the 'evil.' If we could view it from God's perspective, the reasoning goes, we would only see good. A favorite example given is the operating theater. Imagine waling into a gallery overlooking an operating room. There behind the glass is are people dressed in white cutting off a man's leg. You have never seen surgery. You do not even realize there is a medical treatment called surgery. What do you think when you see the 'horror' below you? You scream, you try to get the 'butchers' to stop mutilating the man. But, in truth, what these men are doing is saving the life of that patient. The problem here is not with the Rebbe's analogy or Professor Bauer's understanding (or lack there of) of it. The problem is the Rebbe made statement's without carefully thinking about how they would be viewed by people who are not steeped in the particular theology espoused by him. A more current example of this lack of forethought comes from Rabbi Ovadia Yosef who, not so long ago used the explanation of the Ari for the Destruction of the Second Temple and the deaths that surrounded it to explain the Holocaust. Rabbi Yosef's remarks were met with a similar firestorm of disapproval. My piece didn't change Stephen Feinstein's mind, largely because the fine distinctions needed to make these types of analogies work â in this case, the amputated limb is not itself bad, per se â are difficult to accept for those who do not buy into this line of reasoning to begin with. Going back to the example of the Ari, he was explaining the Destruction of the Second Temple 1500 years after it happened. But what he was really doing without expressly saying so was explaining the Expulsion from Spain less than 100 years after that tragic event, roughly the same distance between it and the Ari's generation as the Holocaust and ours. The Rebbe would say after this experience that it is wrong to explain or justify the Holocaust. It is simply too close, to raw, and no explanation will be accepted. I would say that a God who needs to treat an illness by roasting alive hundreds of thousands of Jewish babies is not much of a God. The Rebbe, I think, would reply that an illness that requires the roasting of those babies as treatment must be a horrible, horrible illness. In essence, this is exactly what is happening today between Professor Bauer and Rabbi Shemtov. The Rebbe's explanation requires belief in a perfect, kind and just God who does no evil. To accept that requires accepting unspeakable horrors as good, divinely mandated and endorsed. For most people, even believing people, this is very difficult to do. The Rebbe's words cut like jagged-edged swords. They were widely publicized and hurt many, many people, especially survivors. The Rebbe meant no harm, but harm was done, nonetheless. Professor Bauer's words are not "unwarranted, unacademic, personal attacks against the Rebbe." They are words of a survivor, a man who saw unspeakable horrors and spent his life documenting them so the world would not be able to forget, not be able to sweep a few million butchered Jews under the rug. What Chabad should do is admit the Rebbe's error, his lapse of judgment, and then move on. But Chabad will not do this because it will never admit that its rebbes were anything less than perfect. The panel discussion on "Haredim and the Holocaust" recently aired on Channel 1 should have included the views of the Lubavitcher Rebbe (Chabad's so-called "King Messiah"), Rabbi Menachem Schneerson. On the subject of the Holocaust, the Rebbe wrote as follows: "It is clear that 'no evil descends from Above,' and buried within torment and suffering is a core of exalted spiritual good. Not all human beings are able to perceive it, but it is very much there. So it is not impossible for the physical destruction of the Holocaust to be spiritually beneficial. On the contrary, it is quite possible that physical affliction is good for the spirit" ("Mada Ve'emuna," Machon Lubavitch, 1980, Kfar Chabad). Schneerson goes on to compare God to a surgeon who amputates a patient's limb in order to save his life. The limb "is incurably diseased ... The Holy One Blessed Be He, like the professor-surgeon...seeks the good of Israel, and indeed, all He does is done for the good.... In the spiritual sense, no harm was done, because the everlasting spirit of the Jewish people was not destroyed." The Rebbe's stance, therefore, is clear: The Holocaust was a good thing because it lopped off a disease-ravaged limb of the Jewish people - in other words, the millions who perished in the Holocaust - in order to cleanse the Jewish people of its sins. There is logic in this theology: If God is indeed omnipotent, knows everything and controls the world ("God presides over the trials of 4 billion people all day long, every day without a moment's rest"), which implies divine supervision on an individual and collective basis, then the Holocaust took place not only with his knowledge, but also with his approval. Schneerson does not accept the idea of "hester panim," or God's face being turned away, to explain why He was not present when 1.5 million Jewish children were murdered. According to some religious Jews, this hester panim was a consequence of man's sins, and, above all, the sins of the Jewish people. Schneerson says that God was there, and that he wanted to Holocaust to happen. But because it is inconceivable, in his view, for God to commit evil, he portrays the Holocaust as a positive event, all the more so for the Jews. After this text was published in the summer of 1980, kicking up a storm, Chabad claimed it was based on an inaccurate Hebrew translation of talks that the Rebbe delivered in Yiddish. The Rebbe, they said, had no idea his remarks were being published. It seems hard to believe Schneerson would not go over every word published in his name, let alone a text put out in Hebrew by Machon Lubavitch in Kfar Chabad. 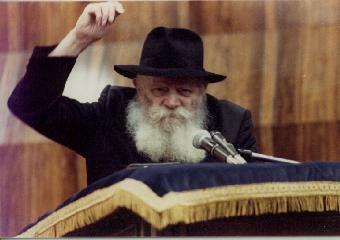 In fact, there is a document written by the Rebbe himself, in Hebrew, which bears his statements about the Holocaust. The late Chaika Grossman, a leader of the underground in the Bialystok ghetto, who survived the war and served as a Knesset member for several terms, published an article in Hamishmar newspaper on August 22, 1980, quoting Schneerson and expressing her profound shock at his words. On August 28, 1980, the Rebbe sent her a reply on his personal stationary. The letter, apparently typewritten, contains a number of corrections in his own handwriting, and is signed by him. In it, the Rebbe confirms everything in the published text. His remarks, Schneerson explained, were based on the Torah. Hitler was a messenger of God in the same sense that Nebuchadnezzar is called "God's servant" in the Book of Jeremiah (chapter 25). The "surgery" he spoke of was such a massive corrective procedure that the suffering (i.e., the murder of the Jews) was minor compared to its curative effect. I was invited to take part in this television debate, but my appearance was canceled at the last moment, perhaps because of my opinions on the subject. The truth is, there are no "Haredim." There are Haredi groups and Haredi individuals, and their conduct during and after the Holocaust took different forms. Since the Holocaust, Jews have wrestled with this issue and continue to do so. Rabbi Schneerson's views are one of many. But Chabad is a large and influential Hasidic dynasty. It has a messiah who lived and died, and many look forward to his resurrection. In this respect, Chabad is a kind of semi-Christian movement. Therefore it is important to know what its leader said. The "King Messiah" did not deny the Holocaust. He justified it. The author is a Holocaust scholar. What do the police do when they are looking for criminals? They publish pictures of the offenders and ask the public's help in finding them. An extreme faction in the Chabad movement has decided to adopt the method, only their 'most wanted' are not criminals, but members of law enforcement agencies and IDF soldiers who were involved in the disengagement. People who provide information about those in the pictures are promised a reward. Chabad's attitude towards the IDF is usually amiable. On Jewish holidays they go to army bases and present the soldiers with Hanukkah donuts and Purim parcels of food gifts, for example. But an extreme sect in the movement, that calls itself the World Headquarters to Save Israel, is launching this new scheme targeting those who participated in the pullout. Members of the organization are circulating a booklet in settlements, synagogues and places where evacuated settlers are now living. The book has photos of soldiers and police officers who took part in the disengagement. They are asking for the public's help in identifying the individuals in the pictures and providing their names and addresses. The booklet also includes 'before and after' pictures of houses, families being evacuated and clashes between security forces and the evacuees. Sentences like "We shall never forget, and we shall never forgive," which is normally used in the context of the Shoah, and "Remember what Ariel Sharon did unto thee," alluding to "Remember what Amalek did unto thee" (Deut.. 25/17), also appear in the pamphlet. There is a history of harassment and physical assult against those who backed Disengagement. In a normal country, what Wolpe and his fellow freaks seek to do would be illegal, and Wolpe would be put in jail where he belongs. But Israel is not normal, so this freak will contine his incitement and his harassment (terroristic threats, really) until some poor soldier is, God forbid, killed by a Chabad-influenced extremist. Wolpe has a bigger following from the Chabad street in Israel than the so-called "mainstream" Chabad leadership does. While it is true that most Chabadniks are not violent, some are. And Wolpe's influence is strongly felt in NRP-settler circles, especially in the most violent extremes of settler culture. Wolpe is a major backer and the chief theologian, so to speak, of the late Rebbe as the messiah. His publications are plastered with the 'messiah's' picture. It doesn't take a rocket scientist to see the horrible potential for violence from Wolpe's activism. He belongs in jail. Let's hope he is put there now, before innocent people are hurt. Around the Chabad observance of Yud Shvat (the yahrzeit of the 6th Rebbe), much discussion is expended on the Holocaust, anti-Zionism, mesiras nefesh, and particularly, the ultra-frum response that kept hundreds of thousands from fleeing Europe. The 6th Rebbe of Chabad indeed advised that, given the proper service of Jews, there might be no war.…Other gedolim advised their followers to stay, counseling that a secular Zionist Israel or a free America would cause damage to the people's frumkeit. Similarly, at Chaf Dalet Teves, the yahrzeit of the first Chabad Rebbe, much discussion centers on the fact that the first Rebbe supported the oppresive Czar over the forces of egalite' under Bonaparte. RebelJew points out that France at the time of Napoleon was not "frum," and that nothing much is left of pre-war European Jewish learning, while yeshivot flourish in Israel and are supported by the government there, and America has an exponentially growing, flourishing haredi community. However, my question is on the logic. Since when do we push away pikuach nefesh vadai on a safek (perhaps they will lapse in frumkeit). Would not a better course have been to save themselves and the people and then attend to them in the new places with extra kiruv, extra leadership, as has occurred thoughout the history of Judaism? Now, we get to the real point. Did these Rabanim not have faith in their own ability to lead? Did they prefer millions of dead Jews or Jews living in squalor and oppression to having to face up to their own insecurity in their abilities to shepherd the flock? Was it more important to keep them nursing from pure dogma than to save them from almost certain death? And this is the question I would like you to answer: Better dead than Reform? Is there any defense for this behavior by Chabad rebbes and other gedolim? I don't think so. Do you? 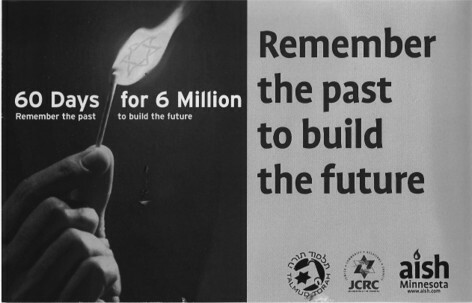 Twelve years ago, the British Union of Jewish Students launched a project called 50 Days For 50 Years, an effort to commemorate the Holocaust by having Jews learn something each day for 50 days in memory of a Jew murdered in the Holocaust. A book of 50 essays written by leading (Orthodox) rabbis and scholars was published and the program was launched. In 2005, TRIBE, a section of the British United Synagogue (Modern Orthodox, Jonathan Sacks is their chief rabbi) relaunched the program under a new name, 60 Days For 60 Years. It then changed the name to 60 Days For 6 Million and "syndicated" the program to communities around the world. Fine. To a point. Now groups like Aish and Ohr Somayach have gotten on the bandwagon (please see the pictures above for an example), and use this program as a way to draw non-Orthodox Jews to Orthodoxy and Modern Orthodox Jews to haredism. But the problem with this program is deeper than subterfuge from Orthodox outreach organizations. First of all, many of the Jews who died in the Holocaust were secular or non-Orthodox, and they were secular or non-Orthodox by choice. They were Jews who left the backwaters of shtetl Orthodoxy for the bright lights of the Enlightenment. Is the proper way to remember those Jews learning Orthodox theology and theodicy? Some of you will argue it is, claiming that Orthodoxy has a monopoly on theological truth. I beg to differ. Leaving aside the overwhelming failure of Orthodox rabbinic leaders leading up to the Holocaust (please see our discussion here), I would still argue that an Orthodox monopoly on this endeavor is wrong. Why? To me, it is too much like the Mormon baptisms of long-dead non-Mormons. The proper way to do this, I think, is to take a Jewish text we all accept and study it or sections of it. For example, take the Pentateuch. Use the text to show how traditional commentary (like Rashi and Ibn Ezra) work, show how halakha is derived, codified and implemented. Show how the Documentary Hypothesis works, how modern Biblical Criticism works, and how Orthodoxy (for the most part) rejects it. Another possibility is to deal with the exact issues the 60 Days program does, but bring varied, pluralistic responses to each one. Of course, when an Orthodox organization sponsors an event like this, one expects the viewpoints to be Orthodox. That is why I don't have much of a problem when the OU sponsors 60 Days, or the British United Synagogue does. 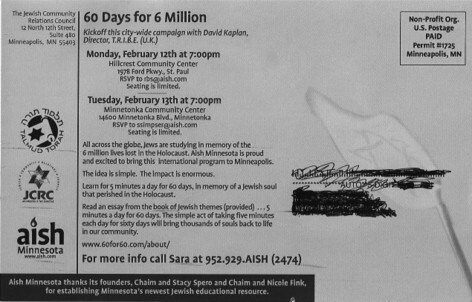 But when Orthodox outreach organizations get involved, especially when those organizations have a history of deception and when their involvement is partially masked by community organizations like the Jewish Community Relations Council (please see above pictures) or the non-Orthodox day school, I think a line has been crossed. Should the Holocaust be used as a marketing tool to bring Jews to Orthodoxy? If you think it should, shouldn't information like Rabbi Elchonon Wasserman's letter (which I first read in the Aish HaTorah beis midrash) and the behavior of the 6th Lubavitcher Rebbe be presented right along with it? Chabad was viciously anti-Zionist until after the founding of the State of Israel. When Jews could have fled Europe and gone to Israel or America, Lubavitch rebbes opposed leaving Europe. The 6th Lubavitcher Rebbe, a vicious anti-Zionist in his own right, told followers there would be no war and that it was safe to stay in Europe. He did this from Warsaw in the summer of 1939, less than four months before WW2 began with the bombing and invasion of Poland. He was rescued by the American government. What did he ask for as he was brought to safety from amidst the destruction and horror? To save more Jews? No. The man asked for the rescue of his silver collection and his rare book collection – Sherlock Holmes in Yiddish translation along side of "sefarim". Not a peep from the holy man's mouth about saving Jews. A U.S. Army reconnaissance unit parachutes into Vilna in 1943. A friend gave Kubert the book last year. “I felt it was a real interesting story,” he said. 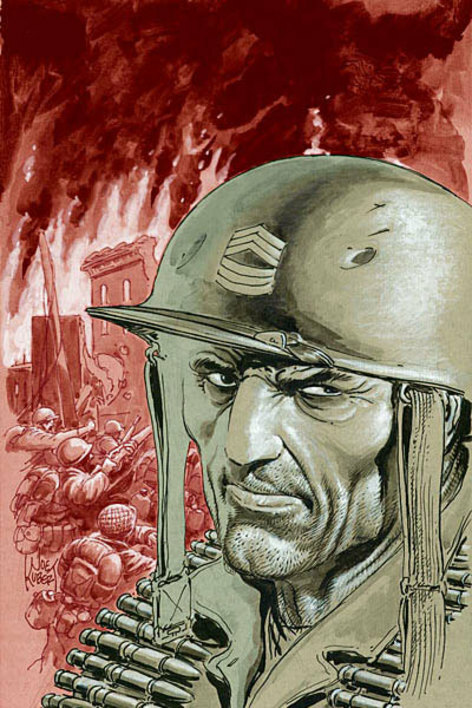 Rigg's book does tell an interesting story, but it is not the story Joe Kubert tells. Kubert has changed the facts and distorted the story to make his comic book more exciting. This would be fine if no mention was made about the historical event that inspired him. To to promote the comic book on that event while distorting that event in the comic book is reprehensible. Perhaps DC Comics can clarify the issue and explain their marketing. I'll keep you posted. For the actual details of the rescue along with other posts about Chabad and the Holocaust, please click the Chabad and the Holocaust link at the bottom of this post, scroll down to the bottom of the page and read upward. Thank you. UPDATE: In this article written last month, Kubert describes the rabbi as a "snotty kid." I'm still waiting a reply from DC Comics, but it appears the comic book does not mention the Lubavitcher Rebbe by name, and does not mention Rigg's book either, so the only link between Chabad and the comic book is the Jewish Week article linked above. This would explain why Chabad's spinmeisters have not yet attacked Kubert. I suspect this will turn out to be a case where Kubert simply wanted to acknowledge Rigg's book for the basic idea of a rabbi being rescued from the clutches of the Nazis, but no more than that. Perhaps he even made this clear in his Jewish Week interview, but the JW blew the coverage. Or, perhaps he was not clear enough. More on this if and when DC Comics and others involved respond. "It is we that gave him the power. We determined that him, his state and his government are the beginning of our salvation. We blessed him before an open bible every Saturday. With such powers, it is no wonder that the false messiah storms forward without stopping, while taking his devotees and the rest of the Israeli people down to the abyss with him." MOSCOW, Ru ssia – Chief Rabbi of Russia Berel Lazar was awarded with the 'Peter the Great' First Class Order. The diploma attached to the Order explains that the Chief Rabbi was honored with this award "considering his activities in advancing inter-ethnic and inter-religious relations, and his great contribution to the spiritual rebirth of Russia’s Jewish community and to strengthening Russian state". What could that "valor, courage and heroism that is displayed while fulfilling a military, official or civic duty" be? This? Also of note: According to The Weekly Standard, this is the first year since Andrei Sakharov's death in 1989 that a memorial concert has not been held in Moscow. Sakharov, perhaps the leading dissident in the Soviet Union, is one of the Russians most responsible for the fall of the Soviet Union. His KGB file has just been published in English. Putin, a former senior KGB leader who regards the fall of the Soviet union as a tragedy of epic proportions, is still a great admirer of Josef Stalin. Jewish-owned building in Gaza. 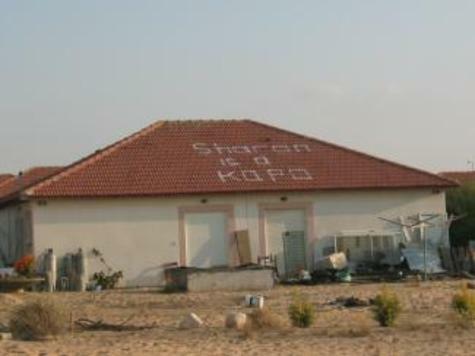 Sign on roof: "Sharon is a Kopo" [sic]. In a controversial move, a Chabad rabbi who vehemently opposed Israel's pullout from the Gaza Strip is planning to establish a memorial center commemorating the destruction of the Gaza settlements, where photographs of soldiers and police who took part in the 'holocaust' of evacuations will be displayed alongside documentation of the former settlements. The memorial, which is slated to be established in Jerusalem in the coming months, will be a "Yad Vashem for Gush Katif," said Rabbi Shalom Wolpe, one of the project's initiators. The plan drew immediate criticism from both Yad Vashem, who called the purported linkage to the Holocaust and to its name nothing short of "revolting," as well as from Holocaust survivors, who have often been offended and hurt by such extreme comparisons. "The repeated use of the Holocaust as part of a political struggle is revolting and unacceptable. Such usage necessarily results in baseless comparisons which cheapen the memory of the Holocaust, are rooted in Holocaust denial, and cause damage to Holocaust survivors and to the basic values of our existence as a nation," Yad Vashem spokeswoman Iris Rosenberg said in a statement. The proposed memorial, which will be privately funded, comes amid a wrenching national debate in Israel over the use of Holocaust symbols by some fringe opponents of the Gaza withdrawal. Extremist opponents of the Gaza pullout shouted "Nazis" at soldiers, with some even wearing yellow - or orange - stars of David on their clothes. Wolpe, a Kiryat Gat rabbi who is chairman of Chabad?s Center for Protecting the People and the Land, said in a telephone interview Wednesday that he was not trying to link the memorial to the Holocaust - "It is horrible enough as it is without connection to the Holocaust" - noting he would not name the center Yad Vashem for Gush Katif, even though he openly defined the plan as such. At the same time, he said that it was imperative for the nation of Israel "to remember and not to forget" the 21 Jewish settlements, choosing the same Hebrew words commonly used to emphasize Holocaust remembrance. "It is the first time in history that Jews expelled other Jews from their homes and demolished synagogues," he said. The international Chabad movement has been adamantly opposed to the disengagement plan since it was first proposed nearly two years ago. Shinui party chairman Yosef Lapid, a Holocaust survivor, reacted with anger to the idea of the center. "They are saying that the IDF is the SS, and [are equating] people that were moved from their homes to hotels to people in gas chambers," Lapid said. "It is very sad that people exploit the name of the Holocaust for political ends," he concluded. Putin Gives Lazar Medal In Quid Pro Quo – Payback For Notorious Auschwitz Medal Ceremony? MOSCOW, Russia – Chief Rabbi of Russia Berel Lazar has been honored with the Medal "60 Years of the Victory in the Great Patriotic War 1941-1945". He received the medal during the 19th session of the Russian 'Pobeda' (Victory) Organizational Committee. The diploma, which is attached to this medal and signed by Russian Federation President Vladimir Putin, reads "this medal is being awarded for having taken an active role in the patriotic education of citizens, as well as making a great contribution in preparing for the Victory Anniversary celebrations". Founded in 2000 and headed by President Vladimir Putin, the Russian 'Pobeda' Organizational Committee involves prominent politicians, scholars, military leaders, as well as public and religious figures of the Russian Federation. This united body's activity is aimed at commemorating the 'Defenders of the Fatherland' – those who have fought for one's country. In addition to presenting this award, this Committee's latest session involved a discussion of the body's future activity. The "great contribution in preparing for the Victory Anniversary celebrations" clearly referrs to the notorious Auschwitz medal ceremony where Lazar 'awarded' Putin with a medal while standing over the ashes of millions of murdered Jews. Chabad, have you no shame? [T]he Federation of Jewish Communities of Russia and the Zalman International Foundation have opened a Socio-Cultural Center for Veterans. The main goal of this new organization, which came into existence on May 5th, is to create reasonable living conditions for veterans regardless of their nationality or religion. At this Center, veterans benefit from five hot meals a week, free medical services, meetings with prominent personalities [i.e., PR/fundraising opportunities for Chabad], and a chance to associate with their friends and peers. This is clearly a response by Chabad to all the negative press surrounding the Chabad-Putin-Auschwitz-medal, and its scope is limited. It also raises some theological problems for Chabad. Even so, it is a good thing – in context. Something Good, Something Bad, 60 Years After The Holocaust – Would The Frierdiker Rebbe Have Approved? Sixty years after WWII came to an end, communities Europe-wide conducted ceremonies of solemn remembrance this week. In many of the cities, Chabad rabbis marched with survivors and community members, remembering those who lost their lives and honoring those who survive with scars that never heal. In Dnepropetrovsk, Chabad Rabbi Shmulik Kaminetski and his board members decided to do something more substantive. At the initiative of Mrs. Yelena Grivina Boglovona, the mother of Dneperpetrovsk's Jewish community president, the war heroes-- many who are living below the poverty line--would be suprised with gift to make their lives a bit more comfortable. "It is sad to say that these people were never adequately rewarded for their service," says Rabbi Kaminetski. So on May 9, more than 1,000 people crowded into the main synagogue to pay a long overdue, token tribute to 500 war heroes. Each would receive a gift certificate towards the purchase of any necessary electrical appliances they needed. The war heroes were surprised and their faces lit up at this kind gesture. Thus far Mrs. Kaminetski counts 500 refrigerators, 800 ovens, stereo sets, and vaccum cleaners--"something to make a small difference in the hard lives of people who suffered so much, and had been neglected for so long." What Chabad does not say is that Rabbi Yosef Yitzchok Schneersohn, the Lubavitcher Rebbe during the Holocaust, believed that only the coming of the messiah would end WW2 and the Holocaust and that all other efforts to save Jews (or further the Allies' war effort) were futile. He therefore opposed the efforts of the Va'ad and other rescue organizations and opposed the Rabbis March on Washington – which is credited with saving hundreds of thousands of lives – as well. He was also a leading anti-zionist who actively worked against the formation of the State of Israel. Rewarding the men who fought and won that war is certainly the right thing to do, even though it implicitly acknowledges that the 6th Lubavitcher Rebbe was wrong. But because Chabad has spent many years covering up the Frierdiker Rebbe's poor judgement during the war years and his anti-zionism, it is unlikely anyone – including the rabbis involved – realize the implication. Chabad theology – just like Chabad rebbes – are fallible. Some, like the Frierdiker Rebbe, more so than others. 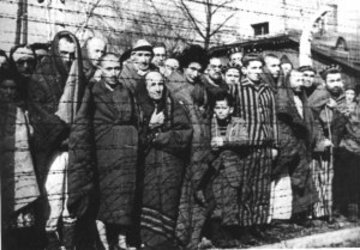 Chabad And The Holocaust, Part 3: "He was a moral failure at this time to condemn us and the Jewish people as a whole for the Holocaust when he in turn did hardly anything except rescue his books and few students' lives." Huge Chabad Anti-Disengagement Demo: Disengagement = Holocaust, Sharon = Haman & Milosevic, Civil War Hinted – "Who Is On The Lord's Side? Let Him Come Unto Me"
Stop Blaming The 'Goyyim' – Chabad, Are You Listening? It is uncomfortable for us to tell the stories of [the rescuers], because that would require us to come to grips with those people and organizations that did not act, or that did too little. But sooner or later, such a stock-taking will bring about a serious discussion of the crisis that afflicted the Zionist and Jewish leadership of the free world during the Jewish people's darkest hour. Again, for the record, Chabad-Lubavitch opposed the efforts of Hillel Kook. The then-rebbe of Lubavitch Y.Y. Schneersohn felt that a messiah campaign was more important than rescue, a truly sick theology. BREAKING! Israel Shot Down 2 Syrian MIG's in 2004 Dogfight – Putin's Response? Sell Missles To Syria – Chabad Medal Part Of Missle Sale Cover? Rabbi Lazar, who was appointed chief rabbi in 2000 by Putin’s office and is known to be personally close to the president, said he had “no second thoughts” about having presented Putin a medal at last month’s ceremony at Auschwitz. The award was in gratitude for the Soviet Army’s liberation of Poland, despite recent steps by Putin seen as anti-democratic, such as curbing the independent media and ending direct elections of governors. If Raul Wallenberg Had Been A Book And Not A Man Would He Be Alive Today In Crown Heights? While reading this story about Giovanni Palatucci, an Italian Righteous Gentile who with the help of the Catholic Church saved thousands of Jews from the Nazis and who himself was murdered in Dachau, my thoughts turned to the sad case of Raul Wallenberg, the courageous Swedish Righteous Gentile who saved thousands of Jews from Hitler, y"s, only to be taken prisoner by the Russians, never to be heard from again. Where Is Man? Where Is Rabbi Lazar? Rabbi Berel Lazar, Chabad's 'Chief Rabbi' of Russia and Vladimir Putin's favorite Court Jew, has written a piece on the 60th anniversary of the liberation of Auschwitz published in yesterday's Wall Street Journal. What is most memorable about Rabbi Lazar's writing? Like his patron Mr. Putin, Rabbi Lazar's commemoration of the liberation of Auschwitz is memorable for what it is missing – any mention of the 1,300,000 Jews murdered at Auschwitz. Instead, Rabbi Lazar gives us an uncanny repetition of Mr. Putin's speech, a repetition that stresses Mr. Putin's political agenda and his fight against Chechen terror. Russia's President Vladimir Putin stood at Auschwitz and received a medal from Chabad's Russian Chief Rabbi and Mr. Putin's favorite Court Jew, Berel Lazar. Guess who Mr. Putin forgot to mention in his speech? 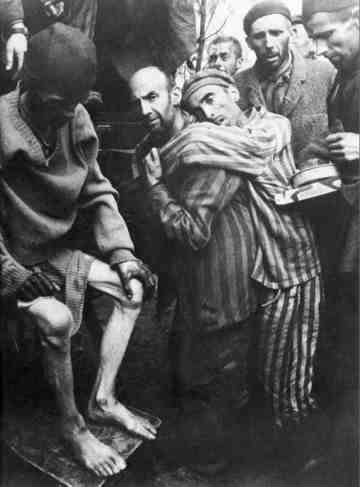 The 1.3 million Jews who were murdered in Auschwitz. "It's incredible," said one official, voicing his dismay that Putin mentioned the 600,000 Russian soldiers who died liberating Poland, and the 27 million Soviets killed during the war, but not the 1.3 million Jews killed at Auschwitz. Mr. Putin, who sees himself as a 'victim' of antisemitism, is also selling mobile-launched missiles to Syria, a nation that supports terror groups and is officially at war with Israel. Does Chabad have no shame? Mr. Putin's Court Jew and Chabad Chief Rabbi of Russia Berel Lazar gave Mr. Putin his medal at Auschwitz a few hours ago. Toward the close of the ceremony and as darkness started to fall, the chief rabbi of Russia, Berel Lazar, presented Putin and the Polish president, Aleksander Kwasniewski, each with a special medal. The rabbi praised Russia's role in liberating Auschwitz and liberating Europe from fascism and praised Poland for improving its ties with its small Jewish community and in hosting the ceremony. In other words, the "state"-issued medal was given by Rabbi Lazar to its issuer – Mr. Putin. Israeli President Moshe Katsav did not participate. In fact, as Ha'aretz reported, even though Rabbi Lazar claimed President Katsav would be awarding the medal, President Katsav did not even know about the medal until he arrived in Poland. Another sick Chabad PR gambit, this time at the expense of the murdered, the survivors and those who paid with blood to liberate them. Oh, and by the way – Russia is selling mobile-launched missles to Syria. The Russian News and Information Agency has commented on the letter signed by members of the Duma (parliment) and others accusing the Jews of fabricating antisemitism to divide and conquer Russia. But the main victim of that anti-Semitic action is not the Jews but President Putin, even though he is invariably polite with the hierarchs of the main faiths of Russia. The trouble is that he will have to answer for the silly and crude escapade of 500 pseudo-patriots, which is bound to have broad international repercussions. As for the mental health of the authors of the anti-Semitic letter, Rabbi Lazar is wrong: Though they are not very clever, they certainly had a specific political goal in mind. The suit filed by the Black Hundred was prompted by a desire to promptly drive a new wedge between Russia and Israel, while the two countries are trying to smooth over misunderstanding about Russian arms deliveries to Syria. The only thing they disregarded is that Mr. Sharon and Mr. Putin will come to an agreement, one way or another, while the Black Hundred and Mr. Putin will never find a common language. But Mr. Putin and Rabbi Lazar have found a common language. And on a day that the Jerusalem Post is reporting that the Russian missle sale to Syria will go forward, Rabbi Lazar prepares to award a medal – at Auschwitz – to Mr. Putin. Unless the earth beneath their feet opens and swallows them both whole. Misuse Of Memory: Chabad Uses Auschwitz To Promote Putin – Is Putin Awarding Himself His Own Medal? However, it is not quite clear where the medal comes from and who is bestowing it. At a news conference prior to the ceremony, Lazar said that he would present the medal together with Israeli President Moshe Katsav to express the gratitude of the entire Jewish people. But no one in Katsav's entourage knew anything about the medal when asked before their departure for Auschwitz. 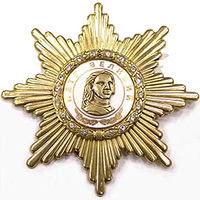 Lazar's spokesperson, however, confirmed that the medal would be presented with Katsav, and said that it was a "state medal" without specifying which country coined it. President Katsav's political advisor, Avi Granot, told Haaretz that upon arriving at Auschwitz they learned about the plan to present Putin with a medal, but "this fact cannot be presented as though the president is a partner to presenting the medal." How much do you want to bet that medal is issued by the state of Russia? See related stories here, here and here. The entire Ha'aretz story can be read here. UPDATE: The Jerusalem Post reports exclusively that Russia will sell "defensive" mobile-launched missles to Syria. 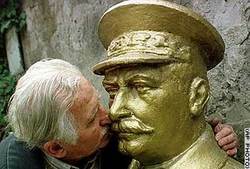 A NEW statue of the Soviet dictator Josef Stalin is to be erected in Moscow, returning his once-ubiquitous image to the streets after an absence of four decades, a top city official said yesterday. Since Vladimir Putin became president in 2000, a number of Soviet symbols - including the national anthem and an army flag - have been restored to use, reflecting widespread nostalgia for the communist era. But the rehabilitation of Stalin - denounced by Soviet leaders after his death in 1953 for encouraging a cult of personality and killing millions of real and imagined opponents - had remained out of bounds. Statues of him were removed from Moscow in the 1960s. Oleg Tolkachev, Moscow’s senator in the upper house of parliament, said a monument was to be erected to Stalin and others who led the war against Hitler. A statue will also be built in the Belgorod region, near the Ukrainian border. In another sign of Stalin’s growing appeal, many prime-time television shows have recently depicted him in a positive light. For the Chabad role in this sickening affair, please see the post below. For a look at Chabad's actions in Ukraine, see here. Russian President Vladimir Putin will be decorated at Auschwitz with the Salvation medal as a symbol of gratitude to the Soviet people for the liberation of the notorious Nazi death camp, Russia's Chief Rabbi Berel Lazar said Monday at a press-conference. into a sickening PR gambit. Read it all after the jump. Update: Tzemach Atlas weighs in here.